Before digging into the list of bad habits outlined below, I’m reminding our readers not to feel discouraged if they currently practice several or even all of these habits. That’s why you’re here – to reflect, learn and grow. I confess that I felt a twinge of guilt while writing this, because I know I practice some of these bad habits myself, “Who am I to give such advice?” I thought. But I’m reflecting, learning and growing as well. I’m already working to become a better listener based on what I’ve learned writing this series, and now I hope it will help you do the same. This is something nearly everyone does: planning out the next thing we are going to say while the other person is in the middle of speaking. When we shift our attention from the speaker to ourselves – to our own thoughts and words – we’re not paying full attention to the other person. It’s extremely hard not to make this listening mistake; it’s natural to want to be prepared, sound smart, give good advice, have something valuable to contribute to the conversation. But we can still do those things without planning our response before the speaker has finished. Take note of the next time you make this mistake, and then redirect your attention to the person speaking. You’ll find that you can simply take a moment after processing what has been said, and then decide how to respond. Even though you didn’t plan, your response will likely be even better because you’ll know the entirety of what was being said. This is a no-brainer. If you’re pulling out your phone when someone’s talking to you, you’re not being a good listener. You may disagree, calling it multi-tasking – “I can listen while I read a text!” No, you can’t – not well, anyway. In Part 1, we talked about giving the speaker your full attention and all that involves – going beyond his or her words to the feeling and intention behind it. We talked about respecting the speaker as someone with something to offer, and as a person with feelings and a perspective of his or her own. Whipping out your phone to send a quick text saps some of your attention from the speaker, and it’s very disrespectful. This is another obvious listening mistake – when you actually stop the other person from talking to speak yourself. It’s particularly hard not to make this mistake when we’re emotional. When we feel anger at what people are saying, we want to jump in and tell them why they are wrong. Try giving people a chance to finish their thoughts before saying your piece – you may be jumping the gun and making an inaccurate judgment based on a misunderstanding of what is being said. Remember: Try to withhold judgment. If things are too heated, it may be best to save the conversation for another time. This is a much subtler bad listening habit. If a friend is telling you about a problem he or she is having, it’s only natural to want to say something that will help. However, this can distract the listener from fully giving attention to the speaker’s thoughts and feelings. If I try to give advice immediately, I might be shifting the focus back to my own thoughts and feelings – about what I would do in that situation and how I would feel. This doesn’t mean you should never give advice; if you have something valuable to offer, you very well should. However, you don’t need to rush into it. Listen fully, attentively and empathetically, keeping your focus on the other’s thoughts and feelings before offering your advice. 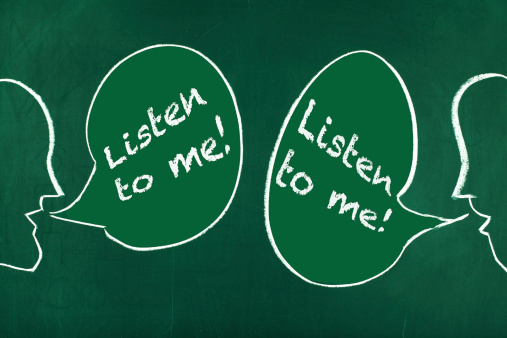 Sometimes, bad listening habits manifest in how we respond to a person. Most of us have encountered this bad habit before: You’re telling someone about what a good time you had at a party, and the person can’t wait to tell you about an even more fun and exciting party he or she went to. Or, you’re talking about a negative experience – for example, how an ex mistreated you in some way – and the other person is eager to insist that he or she had it far worse. When we try to one-up others, we’re making it clear that we’re only paying attention to them insofar as they provide an opportunity for us to talk about ourselves. This is no way to build a meaningful connection with someone, much less a relationship. Say someone’s talking to you, and you want to show them that you understand how he or she feels. You want to convey empathy to the speaker – and, as discussed in Part 1, empathy is an important part of listening well. So you respond to several things he or she says by saying something like, “I know what that’s like,” or telling a story of a similar situation you’ve been in. What’s wrong with that? It’s not always a bad listening habit to convey your empathy in this way, but it shouldn’t be rushed into or relied upon as a response to everything another expresses. That’s because it draws away from the other person’s feelings to your own, which may not be the same – your experiences are never exactly the same as another’s. Besides, as with one-upping, if every response you give is about yourself, it may seem that you’re really only interested in the other person if they give you the opportunity to speak about yourself. However, sometimes when people come to us with problems, they want to know that they are not alone in their feelings, and it can be very good to hear that the listener has experienced similar things. Just be careful here – don’t be presumptuous; make sure you’ve taken the steps outlined below to ensure you’ve really paid attention to the other person’s thoughts and feelings before jumping to your own experience. "The most basic of all human needs is the need to understand and be understood. The best way to understand people is to listen to them." Now, it’s time to take some concrete steps for learning active listening – listening with your full attention and trying to understand another person. Remember: Skills require practice. Don’t expect to become an expert active listener overnight. When you catch your attention straying from the speaker to yourself or to something else, just call yourself back, gently, and refocus using the steps below as tools. Flat-out asking: “Are you saying that…?” is a good way to go. Restating: Repeating back what you think the speaker is saying in different words and awaiting a response. Checking with the speaker in this way will help you understand him or her better; it will also let the speaker know that you’re trying to understand and you’re paying full attention – that you value and respect him or her. 2. Turn off the phone. Limit the temptation of distractions. If someone wants to sit down and have a serious talk, or if someone is giving instructions and trying to teach you something, nothing says “I’m only listening until something else comes up” like your phone going off – especially if you answer it. Before you go into class or to have a heart-to-heart, take a moment to shut the phone off. This establishes right off the bat where your attention will be. 3. Try not to judge right away or react emotionally. There are times when this step is not called for – for example, if someone is saying something very offensive or designed to hurt you. However, most of the time (we hope), this is not the case. Go into your interaction with the intent to understand the other’s feelings, opinions, etc. – not the intent to formulate and voice your own. Those things can come later. Other people are full of new information and perspectives; if we listen fully, they may end up changing the way we currently think and feel. Let’s have the courage to give them that chance. If you’re looking to the left, right, back or some other direction beyond the speaker, you’re opening yourself up to a world of distractions; you’re also sending a message to the speaker that you may not really be listening. Facing the speaker will help you be, and be received as, a better listener. Try eye contact, too – some people aren’t comfortable maintaining eye contact throughout the duration of their interaction, but even meeting eye-to-eye occasionally can help re-establish the fact that you’re focusing. Check your ego: You can’t very well make an effort to understand another’s feelings if you don’t care about them – if you’re focused only on your own feelings. Therefore, you may need to start out by checking your ego, reminding yourself that other people have value, and have perspectives and experiences that are likely just as important as your own. As discussed in Part 1, we’re all the centers of our own universes; as a center him- or herself, the speaker is interesting. So get interested in someone besides yourself! Ask for more information: If you’re having a hard time understanding how someone is thinking or feeling about something, ask for more information about the situation. Wait until it is appropriate to do so – especially if dealing with a sensitive subject. Temper your questions by what you think he or she would be willing to share with you. Think about the other person’s view: In his blog post, “Your Most Important Skill: Empathy,” Chad Fowler gave the brilliant advice to build empathy skills by arguing against yourself. This is a very difficult exercise, but can be highly rewarding both in the critical thinking and the empathy departments. Think of a time when you disagreed with someone. Now, try to take the other’s side and develop an argument in support of his or her position. The more detail, the better – you might want to draw on what you know about that person that may explain his or her position, or you may simply reason through that position. Nothing puts you in another’s shoes and out of your own like the ability to debate yourself! Hopefully, what you gain from the exercise will transfer into all your interactions, such as listening to others, not just when disagreeing with them. You gain practically from listening well because it helps you understand your responsibilities and what someone else is expecting of you. You gain socially from effective listening because it fosters closer, more meaningful relationships. You gain in the personal development department from active listening because it gives you new things to think about and, in so doing, expands your horizons. Listening, which is an active behavior, is different from hearing, which is passive, because it involves your conscious attention – not only your ears, but also your brain and many times your heart. The people around you benefit greatly because active listening shows that you respect and have a genuine interest in them. By overcoming the obstacles created by personal ego and self-generated distractions, we establish an environment in which we can listen well. So, now you know about the bad habits people fall into when listening poorly, and you can analyze your own interactions relative to them. You now know concrete steps you can take to become a better and more effective listener. You now know why and how, so listen up! Both you and those around you have a lot to gain from your choice to become a better listener.